A family coffee in La Garenne Colombes! 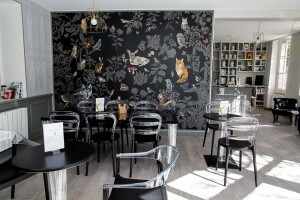 We have just discovered a beautiful place on the place de la Liberté in Garenne Colombes : Supercalifragilis. You know, it’s that kind of place you dream to take a break for lunch or a take snack. It’s a sophisticated place, very cocooning where our children are as welcome as us. It’s a real family coffee because besides finding a high chair, kids toilets, a changing table and a play area, there is also a room to do workshops! And for us adults, two areas: the tea room area with armchairs and coffee table and a lunch area. And cherry on the cake, which are very good, Supercalifragilis also sells books or playful games on the art, history … for young and old and also products around tea and coffee. A place to discover as soon as for the tea, the workshops and the cakes! Looking for a place near the Buttes Chaumont to take a snack with your child? 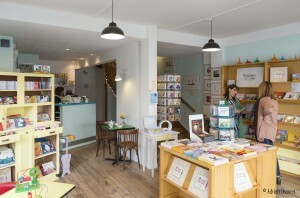 Discover Le renard et l’entonnoir : unique place that mixes tea house, book and music store for children and workshops around their passion: music (song writing, musical awakening …)! They propose to recharge one’s batteries with a snack in a musical atmosphere. An adapted snack is proposed to your children with high chair for the little ones and cabana area for taller. And a nice selection of teas for parents, to drink in beautiful cups: that come from their grandmothers! Open Monday to Saturday 10AM – 7PM. Add: Changing table, toodler step, toilet set in the toilet. Want to have a snack after a nice walk in the Bercy’s park? Or lunch with your baby before to shop at Bercy Village ? 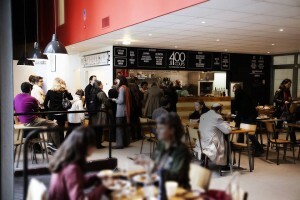 Discover the restaurant of the Cinémathèque : les 400 Coups ! In addition to offering food of fresh and seasonal products, everything is planned to welcome your child. High chair, a play area (book, slate, Kapla … ) available on especially in the week-end and a changing table in the Cinematheque’s toilets ( ask a token in the reception to access in) .